This collectible post card depicts the "Yankee Clipper - NC18603" as it passes over the waters of the Long Island Sound. 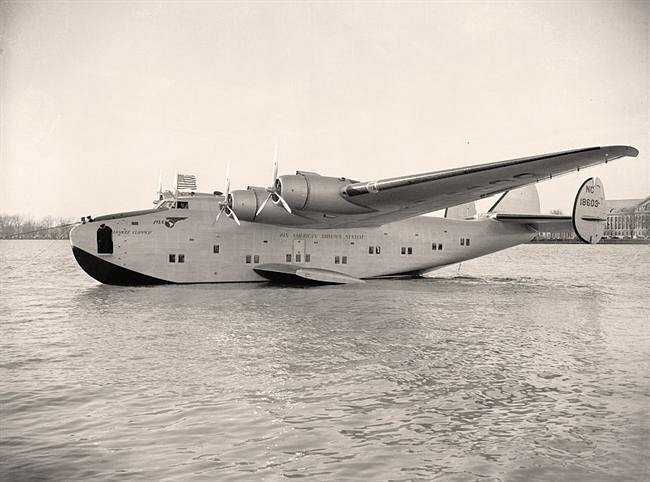 The "Yankee Clipper" was originally placed into service between Port Washington (Manhasset Bay), New York and Southampton, England during the Spring of 1939. 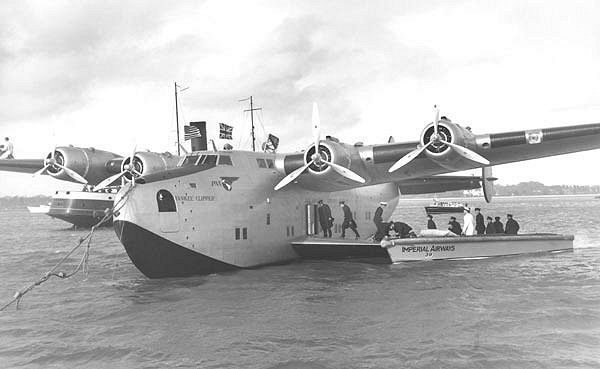 The inaugural flight took place on June 24, 1939 when the "Yankee Clipper" departed Southampton, England en route to Port Washington, New York with intermediate stops in Ireland, Newfoundland and New Brunswick. 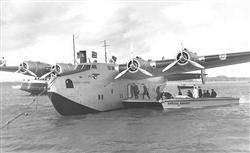 In 1940, air service from the New York area was subsequently scheduled between the Marine Air Terminal at LaGuardia Field in Queens, New York and Southampton, England. Only twelve B-314 "Clipper" aircraft were built by the Boeing Airplane Company between 1938 and 1941. 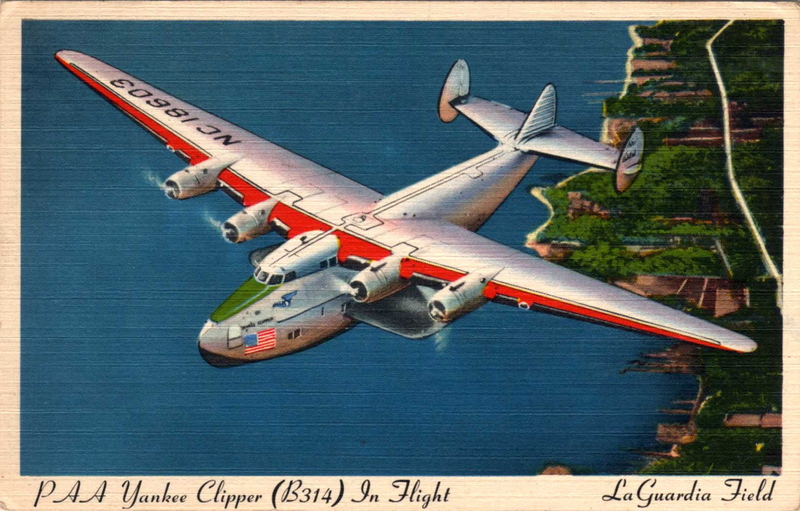 The "Clipper" aircraft were placed into service worldwide, and the last B-314 was retired in 1946. The Nassau County Police Department - Marine Bureau regularly provided security for the "Yankee Clipper" as it landed, taxied and subsequently took off from Manhasset Bay waters. 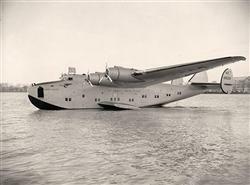 This photograph depicts a shuttle vessel that was regularly used to ferry air crew and passengers from the Pan American Airways Terminal at Manhasset Isle, New York to the moored "Yankee Clipper" B-314 aircraft in Manhasset Bay. 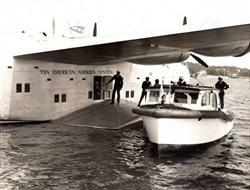 The Nassau County Police Department - Marine Bureau provided security during times of embarking and debarking. This photograph depicts the "Yankee Clipper - NC18603" moored in the vicinity of LaGuardia Field in Queens, New York. This photograph depicts the "Yankee Clipper - NC18603" moored near Southampton, England.